The Americans with Disabilities Act, which became law in 1990, sets access standards for public buildings, and many residential remodelers conform to them to ensure that handicapped people have equal access to facilities in the home. 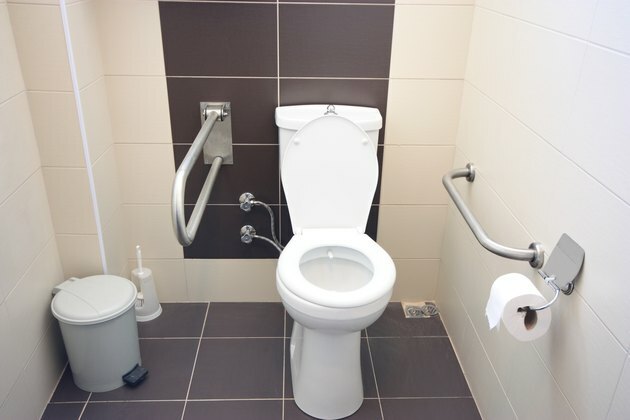 ADA standards for toilets regulate height, clearance in front and on the sides, positions of grab bars and toilet paper holders, and the operation of the flush mechanism. Most of these requirements are common-sense ones. Whereas the height of a standard toilet is 17 inches or lower -- 14 1/2 inches is a common height -- the ADA guidelines mandate a distance between 17 and 19 inches from top of the seat to the floor on a handicap toilet. If the toilet is for use by children, the height must be from 11 to 17 inches. Many toilet manufacturers sell <ahref="http: www.us.kohler.com="" us="" how-to-shop-for-toilet="" content="" cnt800391.htm"=""> </ahref="http:>comfort models that conform to this height guideline, such as the Kohler comfor height toilet, but if replacing your toilet isn't in your budget, you can increase the height of your standard toilet with an elevated seat. If you're designing a bathroom for handicapped use, it's important to note other ADA standards designed make it easier for wheelchair-bound people to maneuver around the toilet. This means having a clear floor space with at least 48 inches between the walls on either side of the toilet, and the toilet should be positioned a distance of 18 inches from one of the walls to create an approach space on the opposite side of the toilet. If the lavatory is situated on a side wall, it must be at least 18 inches from the toilet. Space requirements in front of an ADA toilet vary according to the placement of the toilet, but in general, you need about 66 inches from the back wall to the wall opposite the toilet. Additionally, grab bars are required in an ADA-compliant bathroom or toilet stall. You should provide them behind the toilet and on the side walls, and they should be 33 to 36 inches above the floor. The ADA doesn't specify height or distance requirements for toilet paper holders; they must simply be "within reach." The flush control must be automatic or operable with only one hand, and seats that spring up automatically after use are not allowed. Many of the clearance requirements for an ADA-compliant bathroom depend on the layout of the bathroom. Besides the height of the toilet and the space around it, the ADA also specifies height and clear space for the bathroom lavatory, as well as the distance between the lavatory and the toilet. The requirements can make planning complicated, so be sure to check your drawings with local building authorities.